This is our favorite sage and is what we like to use. The sage stalks average about 12-20". This is a very light sage, so four ounces is quite a bit. Cedar needles from California trees that are very aromatic. Cedar is often used in the sweat lodge ceremony. A few pinches are thrown on the red-hot rocks, immediately sparking into a yellow glow and releasing their aroma. 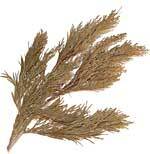 The smoke of burning cedar is said to attract the good spirits and eliminate negative energies. The image shows a full cedar branch. These are just the individual needles with no stems.